The scenic long drive towards Kerim beach was over and I returning back with the thought of stopping at Olive Ridley Turtle nesting site i.e., in-short – Morjim beach. Turtles yet to arrive. Locals say in the month of December turtles are here to lay eggs. It is a protected area. Maybe December I will try to visit again. The best about Morjim beach is long walk up to Arambol beach passing through Mandrem and Ashvem beaches. Not too much of crowd – silence existing. Shacks preparation is going-on as rain has just finished and I watching and walking. A man request to have Coconut water. Natural drink – why not specially before the long walk and the walk continues… Another bicycle person carrying pineapple on the way towards Arambol beach – cliff is far but visible. 15 minutes approx. and I standing right in-front of cliff, Arambol beach. A small path very close to cliff and I walking while watching makeshift shops selling tshirts/kurtas/thailas/sun-glasses/shorts/Tibetan stones etc. etc. Afternoon hours I was hungry specially after 3 km approx. walk which I seldom do. A shack and I enter. Omelet-bread tea – The request and a question: Whats interesting around Arambol other than beaches? sweet lake – said He. sweet lake? Where is it? And sand dividing them into two separate identity. Tourist having good time – sun-bath. Few within the sweet lake as well few resting. Lifeguard was present And I inquire: Why sweet lake – The name? Because the water flows down from the hilly-area present and water is sweet specially when it is very near to beach i.e., why is called sweet lake. I thought of jumping inside the lake to swim but I was not ready today but will visit again – said I. 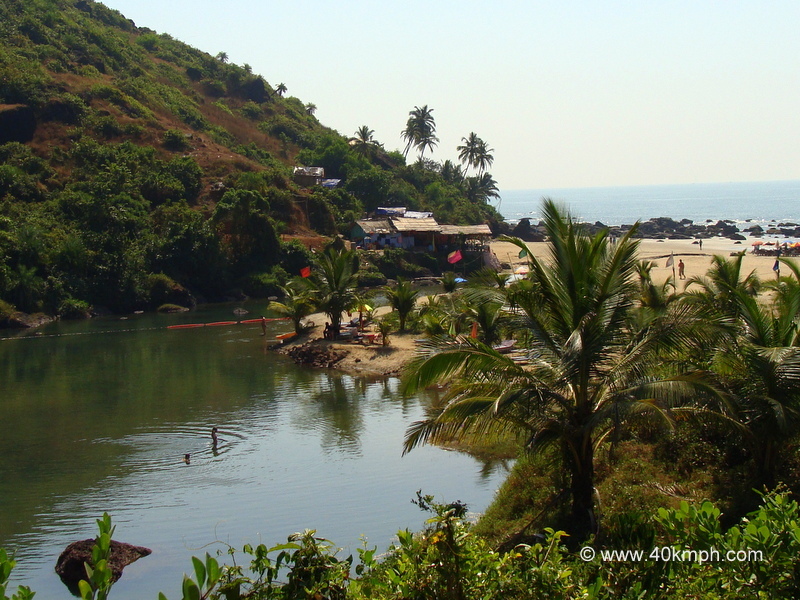 1. reach Arambol beach – walk towards cliff-area and walk further for 5 minutes to reach sweet lake. Sweet lake is on the borders of Arambol And Paliem said the lifeguard and as per his narration there are only two ways to reach. Thank you – said I and with the thought of swim I was walking again watching again.